The closest commercial airport is Marco Polo Airport (ICAO: LIPZ, IATA: VCE), on the mainland near Mestre (a more typical Italian city, without Venice's unique structure). There is a city bus and a shuttle bus from Marco Polo to Piazzale Roma. See the details in the By Bus section below. By Boat - Turn left on leaving the terminal and walk 10 minutes along the covered walkway to the boat jetty. Alilaguna water-bus costs €15 for a leisurely 75 minute boat trip. Murano costs €8 and takes only half an hour. 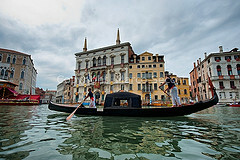 There are three Alilaguna routes to different areas of Venice. A direct waterbus from the airport may be be more convenient than taking the bus to the bus station and then changing to the local waterbus. Note that the waterbus services that run to the airport are operated by a different company (Alilaguna) than the other public waterbus services in Venice, so separate tickets will be required. Alternatively, from the same jetty, you can travel in style (and much faster) by hiring one of the speedy water-taxis (30 mins) for about €110. All these tickets are now buy-able online, as well as the airport waterbus route map. The Treviso Airport (ICAO: LIPH, IATA: TSF), located 25 km (16 mi) from Venice, is relatively smaller but becoming increasingly busy as the main destination for Ryanair, Wizzair, and Transavia budget flights. From Treviso Airport to Venice and Mestre, Barzi Bus Service  offers a €13 round-trip ticket price from-to Venice. Also these tickets available on their bus outside the airport for €13. The San Nicolo Airport (ICAO: LIPV, IATA: ATC) is an airfield directly on the Lido. It handles only small aircraft, as the runway (grass) is about 1 km long, and does not have any scheduled flights, but might be of interest to private pilots (arrivals from Schengen states only) due to its convenience to the city (it is a short walk to the vaporetto landing). Trains from the mainland run through Mestre to the Venezia Santa Lucia train station on the west side of Venice; make sure you don't get confused with Venezia Mestre which is the last stop on the mainland. From the station district, water buses (vaporetti) or water taxis can take you to hotels or other locations on the islands, but walking is usually the best option. Direct trains to Venice are available from many international destinations, there are overnight trains from Munich, Paris and Vienna and also a weekly long-distance night train (four nights) from Moscow via Kiev, Budapest and Zagreb. Venice is well-connected with the domestic train network, Rome and Milano are only a few hours away. Also there are night trains from cities in southern Italy, the Bari-Venezia line having its terminus in Venice. Cars arrive on the far western edge of Venice, but remain parked at the entrance to the city (Piazzale Roma or Tronchetto - Europe's largest car park.) There are no roads past this point -- and never were, even before cars. Car parking is expensive here (26 €/12h, 30 €/24h) and the tailbacks can be quite large. An alternative is to use the car parks on the mainland (terra firma) and catch a vaporetto, train or bus into Venice. Park near the Mestre railway station, and catch a train to Venezia St.Lucia; there are many trains, it is very near (8-10 minutes) and quite cheap. (Don't bother searching for free parking near the train station - there are no free parking spots near.) Besides, Venezia St. Lucia is a good starting point to visit Venice. However drivers going to the Lido can use the car ferry from Tronchetto (vaporetto 17 - frequencies vary), right hand lane off the Ponte della Libertà into the city. If you want to get around a bit more quickly, there are numerous vaporetti (water buses) and water taxis. The best and most tourist friendly Vaporetto map for me is here. The vaporetti are generally the best way to get around, even if the service route map changes frequently. If you are going to be in Venice for a few days visiting, it is a lot cheaper to use vaporetti than private water taxis. If you want to have a romantic ride along the canals, take a gondola ride, although they tend to exist for more scenic purposes, rather than getting people from point A to point B. Since February 2009 the Venice Connected website of the Comune di Venezia makes possible to book online (at least 7 days in advance) most services controlled by the town administration (public transportation, access to the civic museums, access to public restrooms, car park tickets, entrance to the Casinò and access to the municipal WiFi network covering the entire historic centre); the online prices vary according to the projected number of visitors but are always cheaper than the current on-site prices (and cheaper than with a Venice Card). You can also get a Venice Card, which has various options that you can choose when you buy it (public transportation, cultural attractions, toilet access, Alilaguna, etc.) There is a 'Junior' version of the Venice that is available at a slightly reduced rate for those between 5 and 29 years of age. Note, however, that a Venice Card is not recommended for those with less than 3 days in Venice, as most of the top attractions are not included in the Venice Card. If you'll be staying in Venice for a week - get the Venice Card and enjoy traveling from island to island and exploring the various museums and churches it offers access to. Venice Cards can be reserved on-line for a considerable discount here. Keep in mind, though, that there are long lines when taking the Venice Card from the ticket booths. The Venezia St. Lucia ticket booth that offers Venice Cards is the one most on the right when you exit the train station. Otherwise, take a walk! The city is not that big, and you can walk from one end to the other in a few hours (if you stick to the paths conveniently marked with arrows in the direction of major landmarks). But it would take months for a fit person to discover every path in the city. Along the way you will discover marvelous art, superb architecture and breathtaking urban landscaping. Exploring the city randomly by walking is well worth it but also be prepared to get lost easily! Signs all over the city indicate the direction to the main attractions, "Rialto" and "San Marco", as well as the way back to the train station ("ferrovia") and the bus terminal ("Piazzale Roma"). These signs make it easy to have the "get lost experience" even as a one-day tourist. Be aware that addresses in Venice are of the form DISTRICT NUMBER (The Venetian word for district is "Sestriere"), not STREET NUMBER. To find a specific place using a map, make sure you know which district it is in. The numbers are assigned at the start of the district and increase as they move farther away from the Grand Canal.